The Best Broccoli Salad - a must for your summer BBQ! 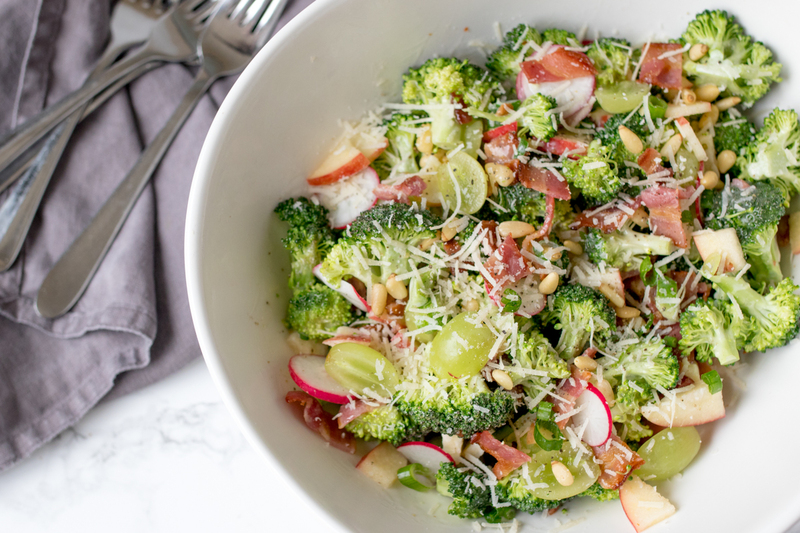 This broccoli salad is so moreish, everyone will want seconds! If you’ve been invited to a BBQ or party this weekend then this is the dish to bring along!A vibrant, healthy-but-delicious salad that can be made ahead. When I first made broccoli salad, I totally didn’t realise the broccoli was raw. I’d eaten it before, but I always thought it was lightly cooked with other ingredients – due to the fact that it’s tender and full of flavor! In fact, the broccoli is simply cut into small pieces – with almost all of the tough stalk removed – then marinated in an easy dressing of mayonnaise, a little sugar and some white wine vinegar. 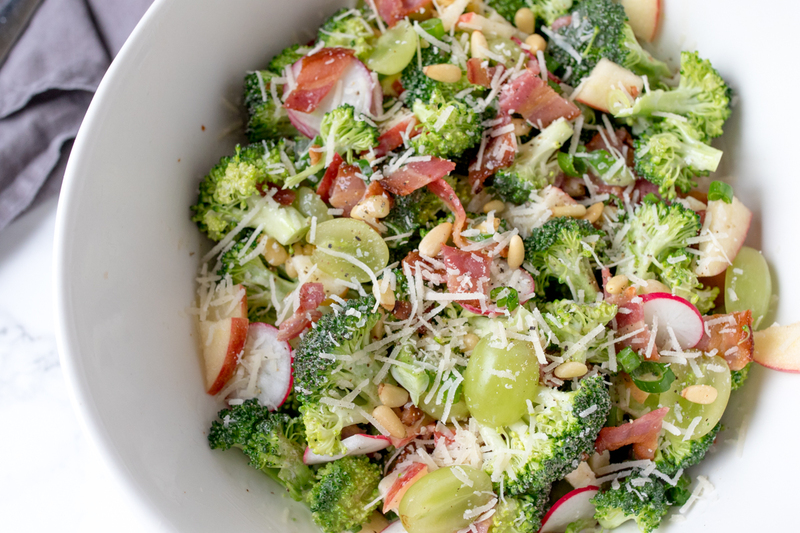 The combination of these three ingredients gives a sweet, sharp and creamy flavor that softens the broccoli just enough. Some people do like to lightly steam the brocolli, but I find this actually dilutes the flavor and can make your salad a bit soggy if the broccoli isn’t drained well enough. 1. 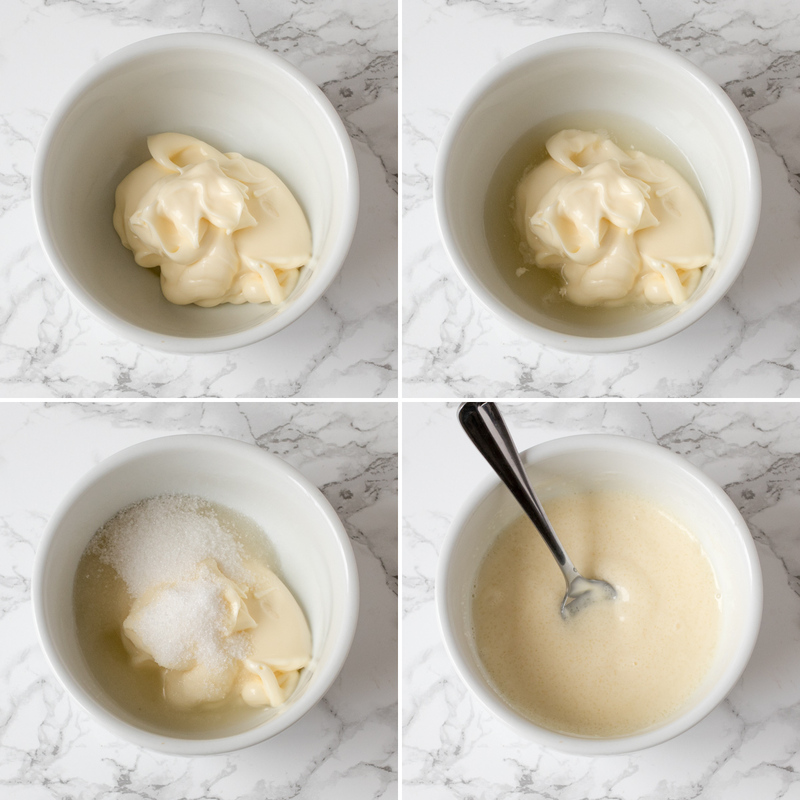 Mix the dressing ingredients together in a small bowl. 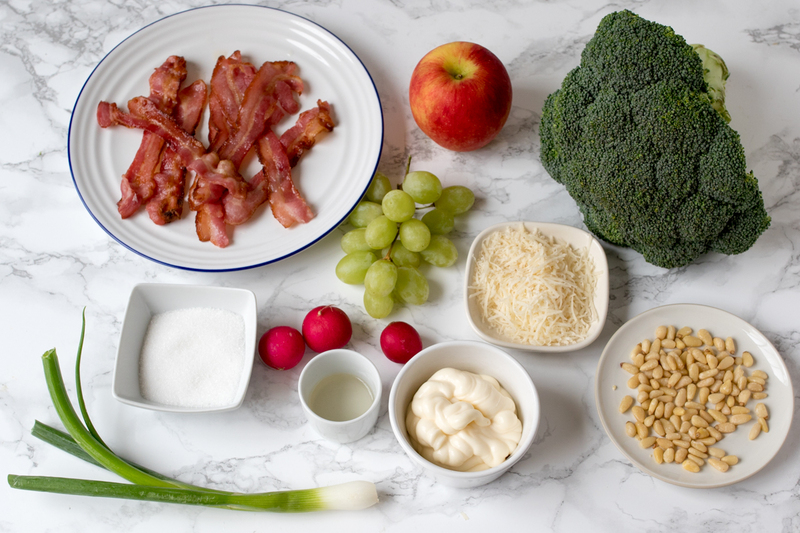 Place in the refrigerator for 10 minutes (the sugar should dissolve during this time) whilst you prepare the salad. 2. Cut the stalk off the broccoli and slice into small florets. 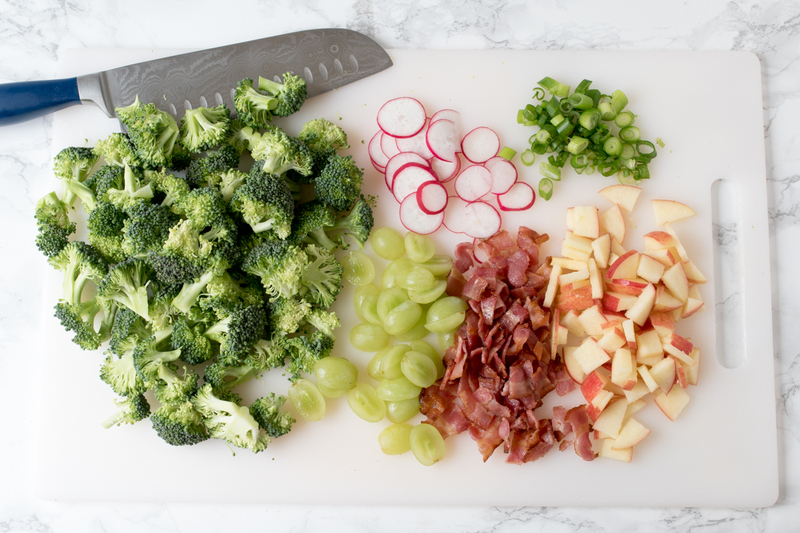 Cut the grapes in half, slice the radishes, scallions, bacon and apple. 3. 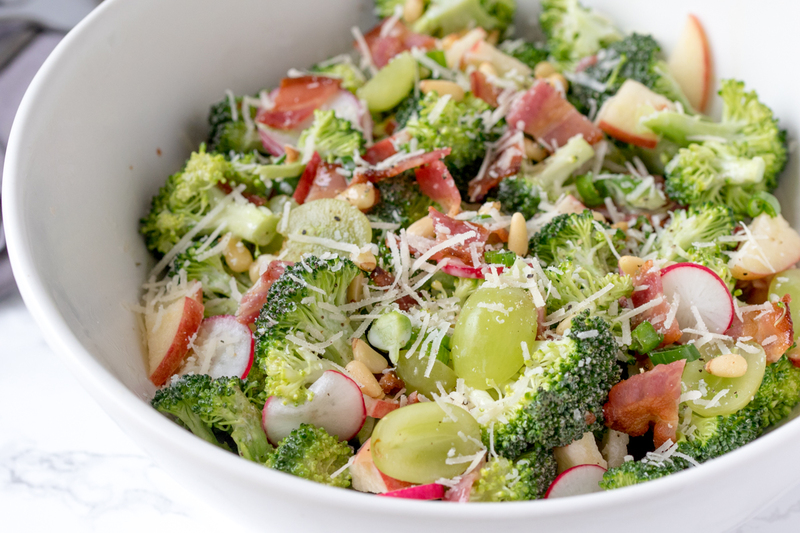 Place the broccoli, grapes, radishes, scallions, bacon and apple slices and pine nuts in a large serving bowl. Take the dressing out of the refrigerator and stir, then pour it on the salad and toss everything together. Sprinkle on the parmesan, then allow to sit for 10-15 minutes to let the flavors develop before serving. Note: You can cover and refrigerate for 2-3 hours if you’re making this ahead.